Bucks For Eid| Aishwarya Goat Farm | Devgaon | Manchar. 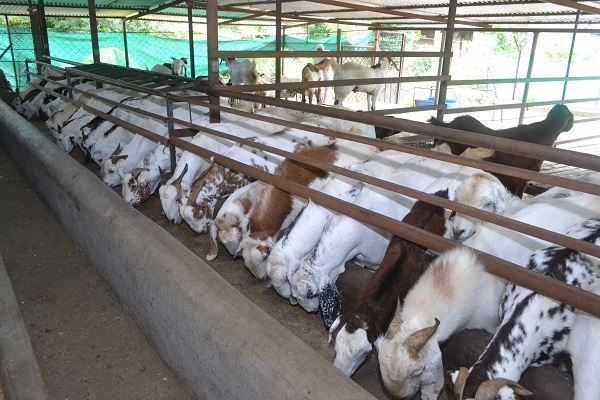 The project is based on raising 100 Eid goats per year in a farm continuously for last 2 year.I know everything about the speciality of eid goat but I used to supply breeding goat only but last 3-4 years eid goat customers market value was good and they didn't get the best goats for eid in market. that's why i am starting the business door step eid goat supply around pune ,mumbai city and all over Maharashtra.These male goats are born in our farm and we raise them at our farmland for 10 to 12 months on biological (Desi) feed, As these goats are fed properly on formulated fattening feed, and weight is available as you want. Than we sell it to our targeted customers, market with in our social circle at market price. Finding a suitable animal on eve of Eid-Ul-Adha is problem for urban Muslim population, going to animal’s marketing, dealing, bargaining with trader is very hard and difficult to find healthy Goat at reasonable price. We have our own land and we used to keep animals there, so Idea is to solve this problem by keeping the goats ourselves and other farmers at our village and to sell to direct customers in our Aiashwarya Goat Farm Pune District.